Arden Irving and I have been continuing to get around the city and visit some historic locations and learn about the history of Perth. We finished our geography section of this block with a walk to Herrison Island, where we visited that kangaroos again, and sat on the riverbank for a snack and continued reading, "Seven Little Australians." We did some research into Yagan's story, since we also visited his monument on the island, and looked into the changing landscape of the city given the removal of many of the wetlands that once existed. Last week we moved onto using some of the City of Perth's tourism walks to learn about settlement here, and we started with covicts and colonials. This tied in nicely to our visit to Fremantle Prison (which we hadn't done since Arden was very little, so it was interesting to go through again; Irving also largely enjoyed it). We are thinking of heading back to do another of the tours later in the year. Out front of the prison; some of the residences. Heading back towards the centre of Fremantle. Stopping off for hotdogs at Wassup Dog after our busy day. Our view from Wassup dog. We've all been learning about currency and money and the difference between the two and looking at how money has changed over the eras, and how gold has been used throughout time. This series, Hidden Secrets of Money was our starting point and has been quite enlightening. We ran into an Australian mint currency exchange in Forrest Place, where it was possible to get new coins, and Arden was keen for some, so he exchanged old currency for new. He has been busking regularly for quite some time now, to learn about saving currrency, donating and having a bit to spend, but this week he was quite pleased to receive some macaroons from a market stall holder. This was a bit of a new event for him. Amusingly sometimes Willow has been better at imagining random odd objects and receiving them. Irving has been dismantling things regularly for quite some time....all of the others around here had largely given this up by 2-3, so last night I was contemplating that we might need to get some cheap objects from the op shop to work on pulling apart and putting together again, to turn it towards something constructive...so today we removed some cupboard handles to clean the doors, put them back on again after, and clean the latch on my empty essential oil box and put it on again...all the while getting in the habit of putting the screws and bits in a container so they don't get misplaced. 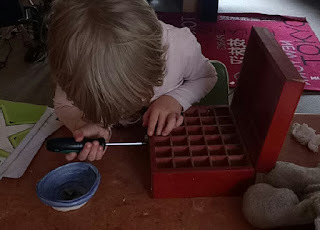 It certainly engaged him for a while, and I'm hoping that with encouraging the idea of putting the bits together it will make our misplacing useful bits happen less...Next thing we need to develop is tuning instruments, as he keeps retuning the violin and guitars! Arden and Gabriel both got some lovely new instruments from a local instrument maker who works in jarrah. Gabriel is working on learning to blow through a reed currently, on his xaphoon, and Arden got a mini-size flute (was meant to be a piccolo but is probably a touch large), all the same Arden is quite pleased with his new instrument. Willow has had a bit of interesting events happening recently, a film she was an extra in, "Hounds of Love" is finally in the cinema, and we will hopefully get to see it, and see if her scene made the film. She also volunteered to help out in a WAAPA performance, as she thought that her circus skills might be helpful, so now she has a small part in "Life is a Cabaret". I have been doing quite a bit of sewing, working on another bag, tidying up some bits that needed repairs in my pile, and then adding some detailing on this skirt I bought of ebay before I started wearing more old-fashioned clothes. I took the skirt in earlier in the year, to make it more comfortable by giving it a waist, and then inspired by Evelyn Wood's youtube make overs, I added these details onto the bottom of it. We also headed off to see Don Quixote as a ballet at His Majesty's recently. I really enjoyed the fight scene, and loved that it was possible to see the influence of fencing on this style of dance. I was also a bit excited to be wearing my lovely new velvet dress that I had purchased off Evelyn Wood's site in her sale section. I haven't had quite such a lovely dress since having kids I think!